We at Minnesota Theater Love recently got together with our theater blogging friends to award the 2016 Twin Cities Theater Bloggers awards. We discussed and debated and voted and even after all that, we still had a few shows to which we wanted to give a little more love. I mean, come ON. Wade A. Vaughn and David Mann as brothers in Loudmouth Collective's production at the Open Eye Figure Theater. Like I suppose you could do any better than that. Dashing back and forth in time, in seemingly random order, this two-hander at Pillsbury House Theatre (with the marvelous Jasmine Hughes and Sarah Agnew) perfectly captured the elusive moments that make up life and love. Minneapolis Musical Theatre had a fabulous year, and this show was outfreakingstanding. Tuneful, hilarious and shocking; every cast member utterly committed, and directed with the perfect tone. LOVED. New Epic Theater immediately became one to watch with this pair of ambitious and perfectly realized plays performed in repertory at the Lab Theater. Amazing cast, beautifully done. As usual, Nautilus-Music-Theater knocks it out of the park, casting Wendy Lehr and Gary Briggle as the young lovers and the Baldwin sisters as the fathers. Gorgeously done, and exquisitely sung. Hilarious and heartwarming play about Mama Darleena, a trans woman running charm classes at a LGBQTI community center. 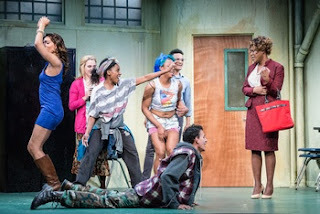 Mixed Blood found a wonderful, young, energetic, racially diverse, and non-gender conforming cast for this new play by Philip Dawkins (whose Le Switch at the Jungle Theater was another highlight of the year). 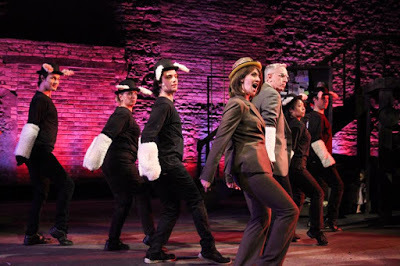 Another great show from Minneapolis Musical Theatre, this little-performed musical about a shady preacher perfectly inhabited the often-tricky New Century Theater space, and brought energy for days. Terrific performances all around, but particularly from Matt Tatone, Jill Iverson and Brandon A. Jackson. This amazing play, written by Carson Kreitzer and performed by Workhaus Collective is association with Walking Shadow Theatre Company, follows the true story of the man who invented Wonder Woman and the lie detector, and lived in a polyamorous relationship. With imaginative, evocative projections by Davey T. Steinman. Young New Prague theater company DalekoArts blew me away so thoroughly with their gorgeous, hilarious production of Urinetown that I was left utterly without words and had to write the whole post with gifs. Christina M. Ham's powerful play about a little-known race riot brings the past and the future together beautifully. Another beautiful work at Pillsbury House Theater, masterfully executed with an outstanding cast. Alice Childress' 1955 play about racial integration, stereotypical portrayals and prejudice, performed with all the resources available to the Guthrie Theater (yay, new Joseph Haj season!) is spot-on and unnervingly true-to-life today. Beautifully done, with amazing performances from locals and imported actors alike. This lovely dance piece by Joe Chvala's Flying Foot Forum at Park Square Theatre explored St. Paul's gangster past through dance, leading the audience through the streets of St. Paul to charming effect. Although I wish I'd studied up on both Bluebeard and Ibsen's A Doll House before seeing this amazing immersive production set at the James J. Hill House by Combustible Company, the excellent use of a non-traditional setting and wild imagery will stay with me. This show was amazing. How could we have not written about it? As soon as this fascinating and thoughtful new play by Michael Elyanow was over, I wanted to see it again. Pillsbury House Theatre presented an amazing staging with a marvelous cast and excellent use of puppets, designed by Masanari Kawahara, who also designed and brought life to a puppet character in the Jungle Theater's wonderful The Oldest Boy. This rare comedy about families preparing for a barbecue thoroughly entertains while also asking us to question our prejudices, check our stereotypes, and interrogate the very nature of truth. Another outstandingly important and relevant show from Mixed Blood Theater. A horror-comedy musical with tons of nods to eighties movies and Stephen King. Written by the marvelously talented Keith Hovis and produced by Revisionary Theatre Collective. 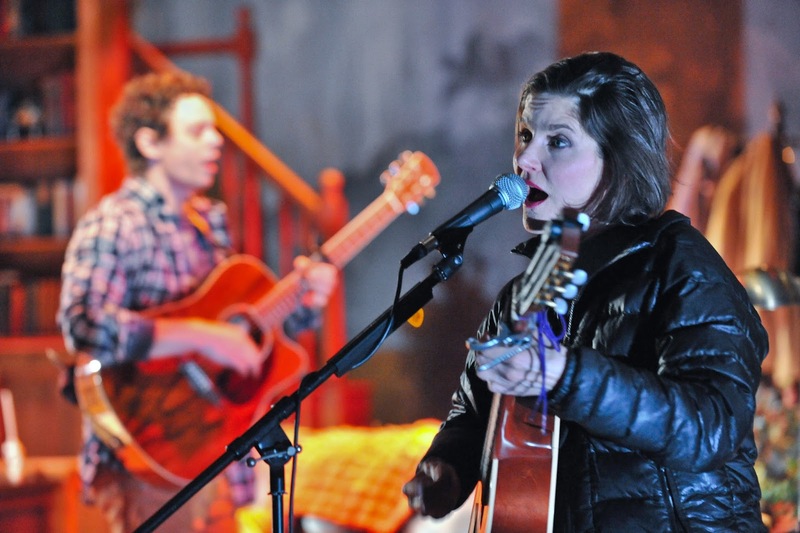 A talented, committed cast performed this hilarious, clever and tuneful show. I need a cast recording! 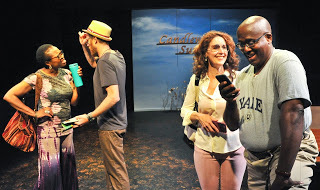 Penumbra Theatre, direction by Lou Bellamy, starring a cast of all-time theater greats and wonderful newer faces. 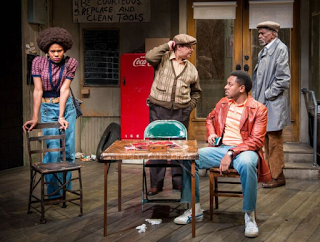 August Wilson's beautiful language has never been as beautifully staged and framed. Perfect. I can't imagine anyone doing it better. We have so much amazing local theater to be grateful for. How can all of this theater magic be all in one year? I can't wait to see what 2017 brings!